Last August of 2016, I wrote an article entitled CSA: We Have a Problem detailing my research into the struggles of CSA farmers to retain existing members and attract new ones. If you have not read that article yet, I suggest you go back and read that first. It still feels very relevant over a year later. Elizabeth Henderson spearheaded the development of the CSA Charter laying out our common values. The 4th annual CSA Day brought together 1500 CSA farmers. Amazon bought Whole Foods to form what I am calling Whole Amazon. I called for 5 million CSA shares by 2030. Blue Apron went public and is in a lot of trouble. For our fledgling industry, the signs are not positive. CSA still serves just 0.4% of U.S. households. Blue Apron and the 100 other copy-cat meal delivery services have taken the food-in-a-box model and reduced it the absurd level of shipping to your door a tablespoon of butter or a single egg in a carton. Growth of CSA farms within our data set has leveled off. Whole Amazon is in a price war with the grocery industry. Wal-mart is advertising local food. So why am I optimistic about the survival and growth of CSA? For one thing, look at all of the competition in this market! The fact that big business wants in tells us that we really have something here. Listen to the Blue Apron ads. What is the first thing out of their mouths? They claim to support local farms, which is an obviously false claim (at least exaggerated) since they put together the meal kits in centralized factories and ship them throughout the country. So by definition, they are not supporting farms local to their consumers. However, with their millions spent on advertising agencies and analytics, they still feel like “local farm sourced” is their strongest lede. The difference is, in CSA, we actually are farm direct. CSA will not be exactly the same model as the one that thrived from the 1990s to the early 2010s. Almost every industry has changed radically since 1990 and ours has too. I believe that the “classic CSA share” is becoming a relic of the past. I believe we need to understand our members better. Even more importantly, we need to understand our non-members better. 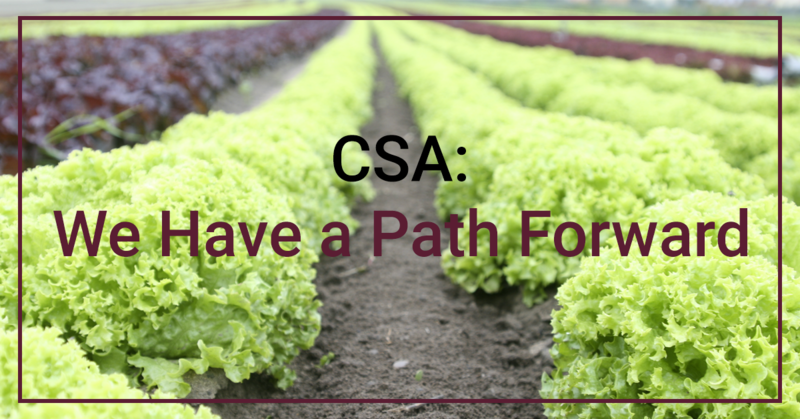 What is it going to take to get the next 5% of the population to consider joining a CSA? It likely needs to be a different “CSA product” package and different marketing message. As I look towards the future, I am aware that the CSA model has been remarkably successful since it was introduced in the United States in 1986 and we must not lose the essence of CSA as we innovate. If we try to compete with grocery stores, aggregators, or Whole Amazon, we will lose. We cannot compete on price, variety, or convenience, though we do need to consider those factors. We can compete on relationship, taste, quality, and freshness. Blue Apron can’t compete with that. Wal-mart can’t compete with that. Whole Amazon is no longer interested in competing on anything other than price and convenience. Direct connection between one farmer and the member. The majority (> 75%?) of the share is grown on the farm. Any off-farm produce is clearly labeled as such. The customer commits for the season and pays some amount ahead of time. The customer is flexible about what is in the box each week based on what is harvested from the farm. This framework allows us innovate to make CSA more customer friendly without forgetting what has made this model successful. Box choice: the standard box just doesn’t work for people, and in the era of choice and convenience, a standard box is no longer good enough. This is the big one based on my research. Flexible weeks: every-other-week options, switch delivery days and locations based on vacation or other factors. Keep the farm front-and-center: how do you get people to know you? Members form the relationship with the farmer and that is what keeps them long term. Payment plans: reduce up-front cost, take payments throughout the season to decrease sticker shock and open CSA up to more people. Emphasize the weekly cost over the seasonal cost. Online payment: if you are not taking credit cards, you are losing customers, especially young people. Cooking education: connect the dots between the box and dinner table. If the member does not get food on the table, nothing else matters. Delivery convenience: work into people’s lives. That could mean home delivery (though I’ve found that members are often not willing to pay the extra price for this), workplace drop off, grocery store drop-off, or simply more drop-off locations. Communication: make sure the member knows everything they need to know to be successful with their share. Give a weekly farm update, consider video. CSA is not expensive: the average CSA shares costs $25/wk or $100/month. That’s less than most people’s cell phone bill or cable bill. It’s less than buying a latte at Starbucks every day. One month of CSA is less than cost of one single meal for the whole family at a quality restaurant. We need to find a way to change the conversation around price of CSA and put it into the proper context. In addition, there is a general problem that CSA by-and-large serves a very thin slice of the population: 30-50 year old, educated, white women (see Ryan Galt’s data). How do we grow beyond this demographic? How do we pull millennials into this? How do we serve less well-educated, less affluent populations? How do we make non-whites feel welcome in CSA programs? I think it is a huge gap that we need to overcome. In fact, in terms of health outcomes of CSA membership, the biggest gains are to be found among people with negative health indicators, who least likely to join a CSA currently (source Tim Walls from University of Kentucky). Blue Apron is willing to spend $144 to acquire a single customer. I’m not suggesting that you should do this, but most CSA farms are spending $0 on customer acquisition and relying on word of mouth to bring in customers. With so much competition for these food dollars, that’s not going to be enough. Right now is the time to start working on a marketing plan for 2018. You are almost certainly not investing enough time and money on marketing. Over the past year, we have been working on a new platform to address these issues and help our farms thrive over the next 10 years. We piloted this platform with 8 farms and 500 end consumers, delivering over 10,000 boxes this season. Look out for an email soon with further details. Whether you decide to join us or tackle these issues on their own, this off-season is the time to get to work. These problems will not fix themselves. CSA is a genuine connection between a farmer and consumer and is more than the sum of its parts for both farmers and consumers. I want to see more consumers be able to take advantage of the health and well-being advantages of being a CSA member. I want your farm to be economically successful with the high-margin sales of CSA memberships so you can take care of your land, your family, and increase your quality of life. I want you to farm for the long term and not burn out. I want your kids to be excited to join your farm some day. I know many farmers shy away from the intricacies of marketing and business. You likely did not expect that your work as a farmer would be as deeply tied to spreadsheets and advertising campaigns as it is to soil health. To serve your land, your customers, and your family well you need a solid business. That’s no easy task.